The Angriest: Star Trek: Voyager: "Non Sequitur"
It is 25 September 1995, and time for another episode of Star Trek: Voyager. 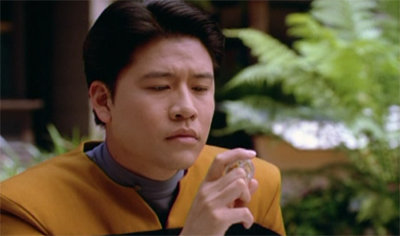 Ensign Harry Kim (Garrett Wang) wakes up in San Francisco, in a parallel world where he never joined the crew of the USS Voyager. While Starfleet begins to believe the confused Kim may be a Maquis spy, Kim desperately works to discover what has happened - and if he can ever return to his own universe. Poor Ensign Kim. He doesn't get a huge amount of attention by the Star Trek: Voyager writers, but in Season 1 he did get to be the focus of "Emanations" - in which Harry is trapped in an alternative reality and must effectively die to get back to Voyager. Now he gets to feature in "Non Sequitur", in which Harry is trapped in an alternative reality and must effectively die to get back to Voyager. Like I said: poor Ensign Kim. It's an episode with good aspects and bad. It is relatively well shot and paced for a mid-90s Star Trek episode, with a nice blend of action and drama. It allows Wang to extend himself a little further than he normally would while confined to the Voyager bridge, and fills out his character quite nicely. It also takes advantage of Paramount's standard New York street set on the studio back lot, and with the clever use of shots from preexisting Star Trek films it build a quite open and expansive sense of 24th century San Francisco. It is also nice to see Garrett Wang get the chance to engage in some drama, have a few action scenes and show off a little romance. Harry Kim is a wonderfully warm and likeable character, but like most of the human characters in Voyager he was under-served by the scripts. It is a nice contrast to episodes focused purely on the Doctor, Neelix and Janeway. He is almost entirely left to hold the fort here, with only brief appearances by the rest of the crew and a little bit of support from a parallel timeline Tom Paris (Robert Duncan McNeill). The downside is that everything is tremendously rushed. There is a lot that the episode could do with a Kim who finds himself back on Earth, but the script does not really engage with it very well. For one thing he does not seem even remotely tempted to stay on Earth with his girlfriend. Similarly Paris seems remarkably okay with piloting a Runabout to his death in order to return the timeline to normality, based purely on Kim's word. The actual circumstances of what has happened and why Kim has woken up on Earth are muddy as all hell, and rely purely on a random alien to crop up for one scene to apologise and vomit technobabble at the audience. These flaws thankfully don't prevent "Non Sequitur" from being broadly entertaining, but there is a huge missed opportunity here that leaves a somewhat bitter after-taste. Still, after such a weak start to the season, I'm happy to take what I can get. Five episodes into Season 2, and two have been enjoyable enough with which to bother. The quality ratio rises to 40 per cent.